Home » HOW DID THE HALLOWEEN ASTEROID SNEAK UP ON US? Earth is getting a very large trick-or-treater this Halloween. On October 31, an approximately 1,300-foot asteroid will hurtle by at about 1.3 times the distance of the Moon. 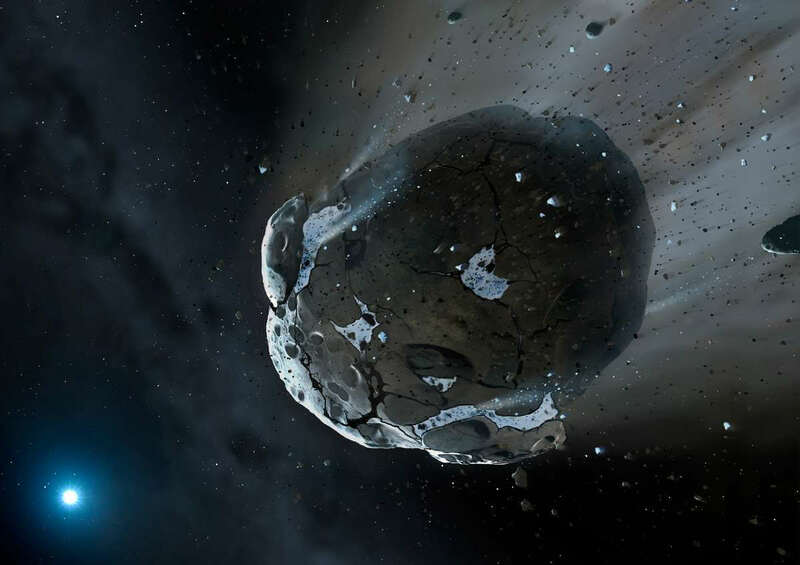 It’ll likely be our closest encounter with such a huge space rock until 2027. The timing of 2015 TB145 (the “Halloween Asteroid”) is spooky, but so is the fact that it managed to sneak up on us. We didn’t even know it existed until October 10–just 21 days before its arrival. Luckily, 2015 TB145 will remain at a safe distance from Earth. But if it were on a crash course with Earth, it would take more than a handful of candy to keep it from defacing our home. The “Halloween asteroid” was discovered by Pan-STARRS–a large telescope in Hawaii that searches the skies for comets, asteroids, and other moving objects. While it’s fairly common for Pan-STARRS to discover these objects, “it’s not common to discover something as big as this passing so close to Earth,” explains Richard Wainscoat, Pan-STARRS principal investigator. Asteroid 2015 TB145 was difficult to spot because it has a strange orbit, he says. The Sun and the planets are arranged in a flat disk shape. This is called the ecliptic plane. Most of the asteroids in the belt between Mars and Jupiter can be found along the ecliptic plane, too, but the “Halloween asteroid” is different. If you could look at the solar system from the side, 2015 TB145 cuts a path at a 40-degree angle to the line of the ecliptic plane. The asteroid also spends a lot of time away from Earth. It orbits the Sun every three years, but like other asteroids with oval-shaped orbits, it doesn’t move at a constant velocity. When it is furthest from the inner solar system (and Earth) it moves slowly. At that point it is far away, faint and hard to detect. And when it swings back near Earth, the Sun’s gravity speeds it up and it zips past us. The asteroid spends less than 5 percent of its time in the inner solar system, says Chodas. “The last time it made a close approach like this was in 1975, when we were not really searching the sky,” he says. At that time, the asteroid came near Earth’s track around the Sun, but at a time when Earth was in a different spot along the track. Asteroid 2015 TB145 is expected to reach its closest approach to Earth at about 1:18 pm Eastern. It’ll blast past us at a speed of about 78,300 miles an hour, and should be bright enough to see with a decent telescope and a star chart. The asteroid’s proximity will give scientists an excellent chance to study it. Scientists hope to image it with a resolution as high as 6.5 feet (2 meters) per pixel, and radar measurements will help shed light on the asteroid’s precise size and composition. So far all we really know is that it’s somewhere around 1,050 to 2,100 feet (320 to 640 meters) in diameter. Chodas speculates that the asteroid could actually be a dead comet–the rocky remains after all of the comet’s ice trailed off behind it. The “Halloween asteroid” won’t hit Earth. But what about others like it? Although our telescopes have spotted about 90 percent of the kilometer-sized (3,300-foot) asteroids that would endanger life on Earth, the medium-sized rocks like 2015 TB145 are harder to track. Chodas estimates that scientists have only spotted about 40 percent of asteroids around the size of 2015 TB145. Lucky for us, rocks the size of the “Halloween asteroid” only hit the Earth about once every hundred thousand years or so. So the odds of an impact are pretty small. Still, NASA wants to find as many of these medium-sized asteroids as possible. With bigger telescopes coming online soon, Chodas says scientists could potentially track down 90 percent of them by the mid 2020s. Finding asteroids is partly a matter of luck. Observing more parts of the sky for more time would make it more likely we’ll spot potential threats to Earth. Wainscoat says Pan-STARRS 2 could be fully operational by next year. Even more promising is the Large Synoptic Survey Telescope (LSST) that’s being built in Chile. With its 27-foot aperture and 3200 megapixel camera, it will be able to detect objects as small as 460 feet (140 meters), even if they’re very far from Earth. The telescope is expected to begin searching the skies in 2020. While Pan-STARRS and LSST are optical telescopes, an infrared scope could also be a big help in detecting potential Earth threats. Since then, the Wide-field Infrared Survey Explorer telescope has been turned on, and it has discovered tens of thousands of asteroids. However, it won’t operate forever. Because WISE is in low Earth orbit, it will slowly fall toward Earth until it’s no longer useful. NEOcam (Near-Earth Object Camera) is a proposed infrared telescope that would potentially track down 10 times more near-Earth objects than we’ve currently located. NASA recently gave the team some funding to further develop the idea. If the project is selected, it could fly as early as 2020. And as for what we would do if we ever spotted a large asteroid heading our way … scientists are still trying to figure that out. Chances are, it would involve explosives, just like in the Armageddon–though some scientists think that would just make matters worse by pummeling the Earth with asteroid shrapnel. “A 400-meter asteroid is pretty hard to blow up, and we don’t have missions ready to launch to do that sort of thing,” says Chodas.